".....and say, 'I have the hope that my Lord will guide me to what is closer thereto in direction.'" Ibn Kathir reports that the Quraysh sent Nadhar bin Haarith and Uqba bin Abi Mu'eet to Madinah (before the Hijrah) to ask the Jews about the description of the final Nabi. The Jews told them to pose three questions to Rasulullah ﷺ. If he answered these, then he was a true Nabi. The first question was that they should ask him to relate the story about some youths who had left their homes in the past. The second question was that they should ask him about the person who extensively treavelled to the east and the west. The third was about the reality of the soul. When they returned from Madinah, they told the Quraysh that they now had a decisive way of ascertaining the truth about Rasulullah ﷺ. When they posed the question to Rasulullah ﷺ, he told them that he would give them a reply the following day. However, he omitted to add "Insha'Allah" (If Allah wills). As a result of this, no revelation came to Rasulullah ﷺfor fifteen days and the Mushrikeen began to taunt him. This caused him much grief, but on the 15th day day, Hadhrat Jibra'eel appeart with Surah Kahaf, in which Allah chides Raulullah ﷺfor not adding "Insha'Allah" to his promise. The reply to their questions came in this Surah and the third was answered in Surah Bani Isra'eel. People of high rank are rebuked even for things that seem minor. Being the best of creation, Rasulullah ﷺwas chided by Allah even for omittin a non-obligatory act. A person can never be cartain of the duration of his life and can die before he can fulfil his promises. Even if he lives, he still cannot be certain whether he will be able to conclude the intended act. 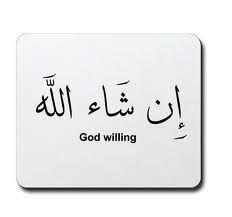 He should therefore add "Insha'Allah" to every promise. "Insha'Allah" should not be added because a person intends to breach the promise. Thereafter Allah says, "Remember your Lord when you forget..." It has been reported from certain commentators, including Hadhrat 'Abdullah bin 'Abbas رضياللهعنهthat a person may add "Insha'Allah" to his promise if he forgets, even though this may be after some time. The addition of "Insha'Allah" will then be considered to be part of the promise. Although this interpretation seems to correlate with the context, yet this verse alone is insufficient to pass a ruling in this regard because it does not clearly state this. Imam Abu Hanifah رحمةاللہعلیهhas mentioned that the late addition of "Insha'Allah" will serve only to increase blessings and amend the omission. However, it will not annul a vow or a promise to free a slave. It will annul these things only if it is added immediately after speaking the sentence. Many other Imams agree with the view of Imam Abu Hanifa رحمةاللہعلیهand this view is substantiated by many other sources. According to this view, the above verse will mean that Allah should be immediately brought to mind when a person errs and forgets Him. This is similar to the night of the Ta'rees when Rasulullah ﷺand the Sahabah رضياللهعنھمslept through the Fajr salah. On that occasion he told them, "When any of you forget a Salah or sleeps through it, then he should perform it as soon as he remembers because Allah says, 'Establish salah for My remembrance.'" ".....and say, 'I have the hope that my Lord will guide me to what is closer thereto in direction.'",i.e. my Lord will guide me to display to you things that are even more concincing of my Nabihood than the story of the people of the cave. Rasulullah ﷺwas therefore able to tell people of stories that predated the people of the cave. These were such that none could have known without divine revelation.